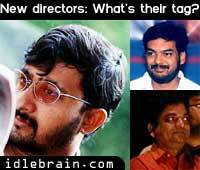 Telugu Cinema - Research - Analysis - New directors: What's their tag? New directors: What's their tag? The dream of any passionate, enthusiastic, die-hard Telugu cinema fan is to enter the Telugu film industry and exude his/her fragrance contributing to the industry and thereby giving life to his/her dream. Be it a hero, heroine, villain, a supporting actor/actress, a technician or the captain of the ship - director, there are a whole gamut of 'waiting-to-bloom' buds out there waiting for a chance to prove their mettle. Very few of them actually get a 'break' and of those very few, only a handful of them sustain themselves withstanding the cutthroat competition and really contributing to the ever- exciting world of telugu film industry. It had good songs, a sizzling heroine, good screenplay, and a heartening performance by Venkatesh but Kalisundaram raa! wouldn't have hit the bull's eye if it was not for the slick handling by Uday Shankar. The same team of Venky-Simmi-Uday fell flat with Prematho raa! What a fall from a whopper to a blooper. Though heavily inspired by Aamir Khan's 'Jo jeeta wohi sikander', Pawan Kalyan's Tammudu was engrossing and entertaining right from the word go. And the man behind this was P.A Arun Prasad. But his next film was a totally insane Bhalevadivi basoo, which made audience scream "Borekottinchavu basoo". G. Ram Prasad's Chirunavvuto had everyone in splits. But his second venture Seemasimham made everyone run away in fear. Fear of the simham or the now hackneyed seema theme? Whatever may be the reason; Ram Prasad seriously needs some rethinking before venturing into his next movie. All the above three directors are no doubt talented but while trying to yield their senses to hero's image, they had to taste failures. Hope they bounce back with vengeance. From a superhit Badri to bakwaas Baachi Poori Jagannath, having learnt his lessons bounced back with a completely novel theme in Itlu Sravani Subramanyam. In fact his latest offering was so good and different that we are forced to believe that he has learnt his lessons right, from Baachi's failure. Chitram was no doubt a surprise hit of 2000 but Teja's second offering Family Circus was a total washout. Undeterred as he is, Teja shot back with a musical hit Nuvvu-Nenu, which not only went one to become 2001's one of the top grossers but also silenced all his critics. 'Poori and Teja came with a bang delivering super hits. They were then boo'ed for their sloppy second ventures but now they have boomed into the hearts of Telugu cinemagoers proving that they are no flash in the pans by regaining their lost glory. Start small and get bigger is what some people believe in. Sreenu Vytla and K. Vijay Bhaskar, I believe, share this school of thought. Sreenu started his career with a low-budget movie Nee Kosam. Though it won a nandi award for him, it did not satisfy him commercially. But his latest opus Aanadam, not only sent waves of happiness throughout Andhra Pradesh but also made him glow in glee. From an inconsequential Prarthana to his latest Nuvvu Naaku Nachhav, Vijay Bhaskar's prayers have been answered with magnanimous success. The success proportion of his movies has been getting bigger and bigger from movie to movie. If Swayamvaram, his second movie was a hit, Nuvve Kavali was declared a super hit followed by stupendous Nuvvu Naaku Nachhav. Having started small, now that's called getting bigger and better. With oodles of creativity, bundles of energy and an undying penchant for success, lets hope all these immensely talented school of directors take Telugu cinema to a new dimension. Tell Sreya sunil how you liked the article.